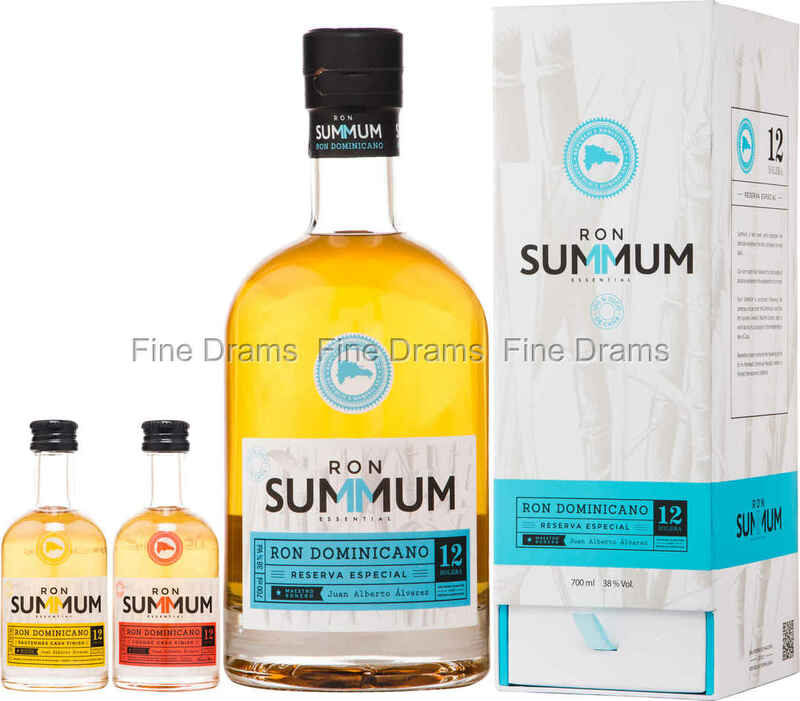 A lovely gift set from Dominican rum company, Summum. Summum take their name from the Latin word for absolute excellence, a fitting title for their rum. This set sees a bottle of the Reserva Especial 12 year old accompanied by two miniatures, one of the 12 year old Cognac cask finish (red label) and another of the 12 year old Sauternes cask finish (yellow label). Each of these rums has been produced by rum Maestro Juan Alberto Álvarez. The Reserva Especial is a delicious rum which has been aged in an American oak barrel Solera system. This bottling serves up notes of tropical fruit, coconut, brown sugar, citrus rind, vanilla and bright oak. The Cognac cask release has a little more complexity, with the dried fruit and grape flavours of the Cognac offsetting the sweetness of the rum. On the other hand, the Sauternes cask release really shows of the sweetness of the rum, with this dessert wine’s flavours enhancing the notes of brown sugar, vanilla and tropical fruit. The cask finish here also adds a delectable sweet grape note. Three terrific rums in one set! This gift pack really shows how much of a difference a cask finish can make to a spirit.